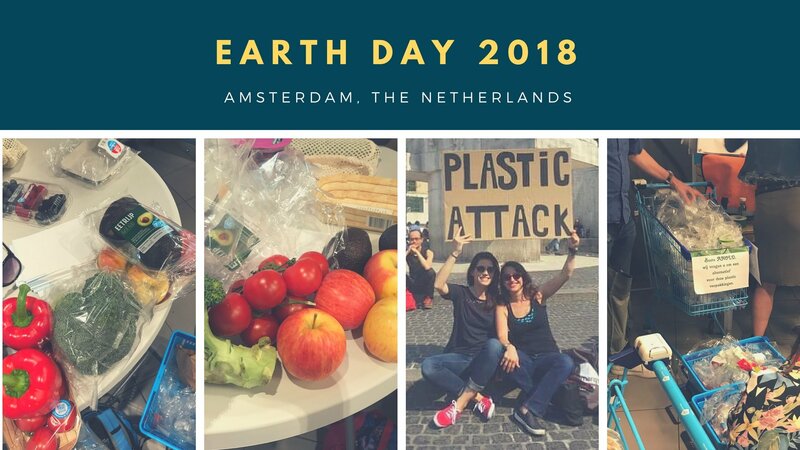 On Earth Day 2018, there was a Plastic Attack in Amsterdam. The attack was located at the Albert Heijn Nieuwezijds Voorburgwal. Over 25 people gathered together to grocery shop. The one twist in all of this is that after purchasing all the groceries, we left all the unnecessary packaging behind! Why a Plastic Attack in Amsterdam? Plastic Attacks are being organized around Europe to take a stand against all the plastic packaging in grocery stores. Can we get to a point where we don’t have to wrap bananas in packaging, especially since they’re already naturally “wrapped” in their own peel?! Can we show grocery stores that more and more people are interested in a lifestyle with less waste so it’s time to look into offering bulk bin options? The zero waste community in Amsterdam is growing strong, and it’s only going to grow stronger in the coming months. With this Plastic Attack in Amsterdam, we hope that Ahold Delhaize (the parent company of Albert Heijn 1The largest supermarket chain in the Netherlands.) and other retailers gets the message to start working on implementing changes. How Can We Leave the Packaging Behind? We’ve grown so accustomed to the grab-and-go convenience and the use-and-toss mentality. I’ve had many people ask me how we can just leave our packaging at the store. It’s simply, really. All you need are some reusable containers to store your food. These don’t even have to cost you anything. If you cut up an old bed sheet and sew up three sides, you can have more than enough cloth bags. Or you can use an old pillowcase as a bread bag. If you save glass jars (mine are from large Albert Heijn peanut butter) from your normal grocery items, you’ll have more than enough glass containers. In addition, if you’re looking to learn how to live a more zero waste lifestyle in Amsterdam, you should check out this comprehensive post where I’ve detailed out all the resources that I’ve found to help live a more sustainable life. Interesting article! If everyone will say no to plastic in our daily lifestyle then we can make a huge contribution towards saving our environment. Keep posting such inspiring articles.